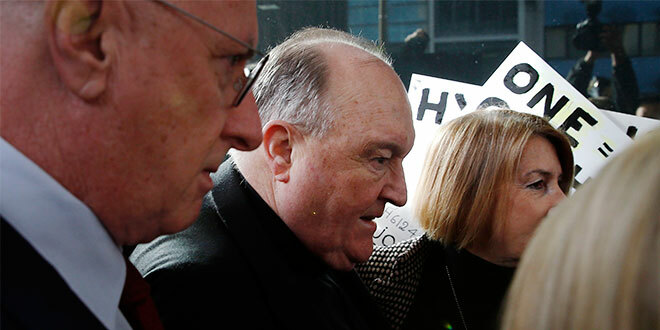 POPE Francis has accepted the resignation of Adelaide Archbishop Philip Wilson convicted of concealing child abuse by a priest, taking action amid loud and public calls for his dismissal from Catholics, priests and even the prime minister. Wilson, 67, who submitted his resignation to the Pope on July 20, said he hoped his decision would be a “catalyst to heal pain and distress”. Ten days later, on July 30, the Holy See issued a one-line statement confirming Pope Francis had accepted Wilson’s resignation. “I have now been informed that His Holiness has accepted my resignation,” he wrote. “I had hoped to defer this decision until after the appeal process had been completed. Wilson was convicted in May for failing to report to police the repeated abuse of two altar boys by priest Jim Fletcher in the New South Wales Hunter Valley region during the 1970s. Wilson denied the accusations and stepped aside after he was convicted, but refused to resign pending an appeal. He is on bail, was sentenced to 12 months detention and is being assessed for suitability to serve his sentence in home detention. As recently as last week, Wilson acknowledged that calls for his sacking were increasing, and on July 19, Prime Minister Malcolm Turnbull added his voice to a loud chorus urging the Pope to fire him. Mr Turnbull instructed Australia’s ambassador to the Holy See, Melissa Hitchman, to lobby Pope Francis for Wilson to be sacked. The National Council of Priests of Australia also demanded Wilson be dismissed. “There is no more important responsibility for community and church leaders than the ¬protection of children,” Mr Turnbull said, welcoming news of Wilson’s resignation. The Australian Catholic Bishops Conference said in a statement that while the judicial process would continue, “Archbishop Wilson’s resignation is the next chapter in a heartbreaking story of people who were sexually abused at the hands of Jim Fletcher and whose lives were forever changed”. “This decision may bring some comfort to them, despite the ongoing pain they bear,” ACBC president, Archbishop Mark Coleridge said. He said that Wilson “has been praised by many for his work to support victims and survivors of child sexual abuse”. Wilson will return to court on August 14 for a magistrate to decide whether he will serve his sentence as home detention. The pastoral care of the Archdiocese of Adelaide remains in place in the hands of the Apostolic Administrator, Bishop Greg O’Kelly, until the Pope appoints a new archbishop.